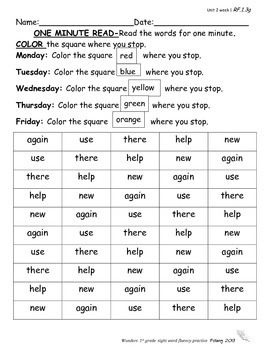 These worksheets can be used in the classroom as an independent partner activity in which students take turns listening to each other read the words. They can also be used whole class or as a homework activity. Students love racing against the clock and seeing their progress with repeated readings. Words should be read from left to right for one minute. Students color the box where they stopped according to the daily color. 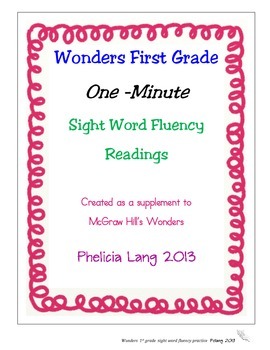 They were created as a supplement to McGraw Hill's First Grade Wonders series. They can also be used by advanced kindergarten or approaching level second grade students.